The usually calm Upper Egyptian town of Abu Simbel was abuzz this week with King Ramses II fever. A crowd of over 3,000 gathered at Abu Simbel 280 kilometres south of Aswan on Sunday to witness a phenomenon that takes place twice a year. On 22 October and 22 February every year, the sun’s rays travel through the Temple of Ramses II at Abu Simbel to illuminate the face of a statue of the Pharaoh and the statues of the deities Amun-Re and Re-Hur-Akhty, leaving the god of darkness Ptah in the shade because of his connection to the underworld. Despite the heat and high humidity, visitors stayed awake all night in front of the temple on the bank of Lake Nasser waiting for sunrise, entertained by a musical troupe performing Nubian folklore songs and dances. The atmosphere was joyous, as hibiscus and tamarind drinks were sampled along with stuffed dates served on large, coloured bamboo plates. The sound of music filled the night air as women, men, boys and girls in colourful Nubian garb danced to the rhythm of the duf, a kind of tambourine. 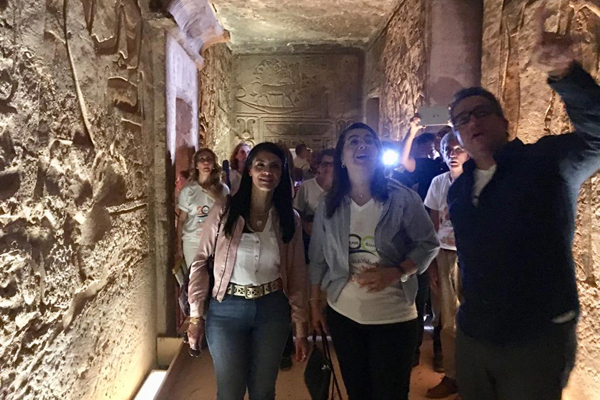 Before the festivities, Minister of Antiquities Khaled El-Enany, accompanied by Minister of Social Solidarity Ghada Wali, Minister of Culture Ines Abdel-Dayem and Tourism Minister Rania Al-Mashat, along with 26 ambassadors, cultural attachés and heads of archaeological institutes from 16 countries flocked onto Abu Simbel Temples’ bedrock to celebrate the event which coincided with the completion of the international salvage operation campaign to save and relocate the Abu Simbel Temples on 22 September 1968. 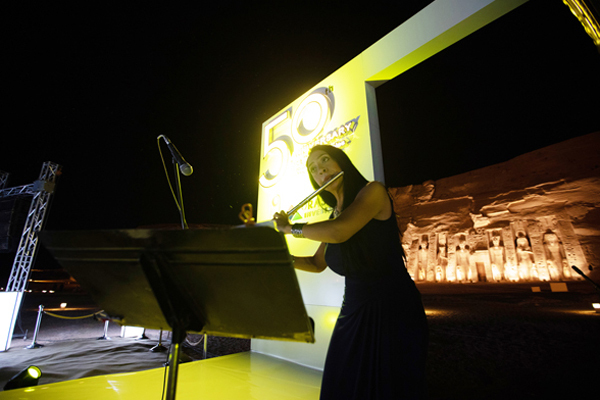 Harp music filled the evening air of Abu Simbel as the guests of the Ministry of Antiquities took their seats in a gala dinner at Queen Nefertari Temple in Abu Simbel’s archaeological area on the banks of the lake. They also enjoyed the Sound and Light performance at both temples which took them back to various episodes of the life and reign of King Ramses II. The famous battle of Kadesh between Ramses II and the Hittites was simulated, as was the signing ceremony of the Egyptian-Hittite peace treaty in both countries. King Ramses II’s birthday, coronation and marriage to his beloved wife Nefertari were also shown with lights, in addition to the construction of their temples and their official opening. Guests toured both temples and the artificial rock on which King Ramses II Temple was reconstructed. The Swedish ambassador was keen to visit the rock because a Swedish company built it. 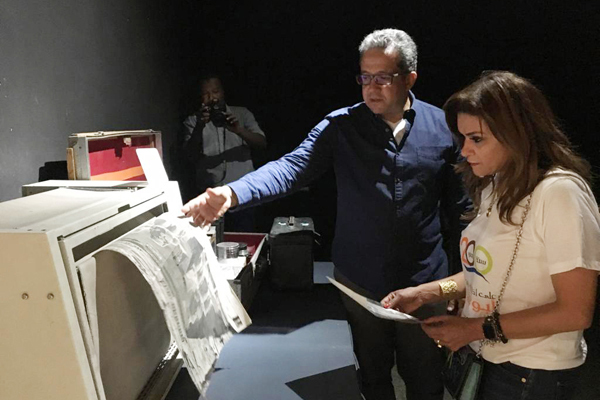 They also toured the Abu Simbel Documentation Centre where a collection of documents and photos are displayed to show the phases of relocation. 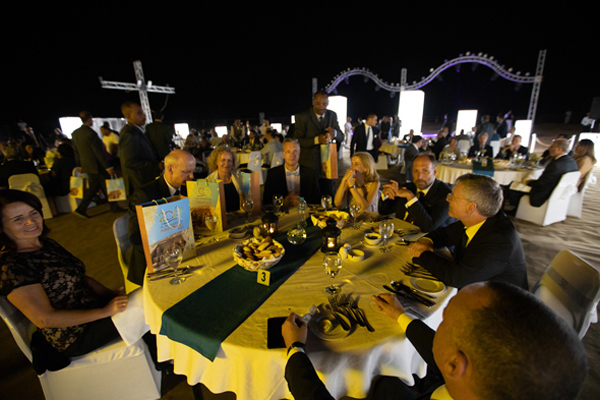 During the gala the Ministry of Antiquities distributed souvenirs commemorating the 200th anniversary of the discovery of the temple, including cups, key chains and T-shirts with the logos of both UNESCO and the ministry. 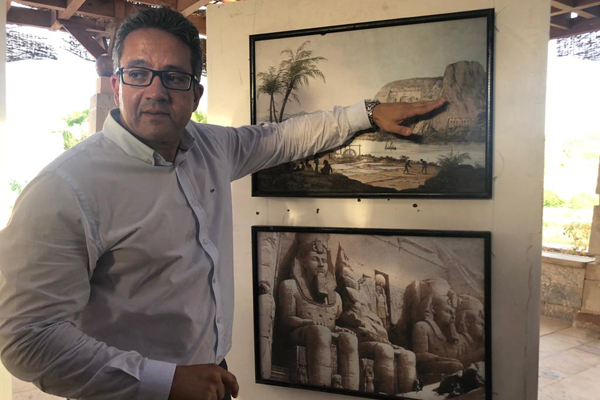 “This year’s celebration is not only a promotional campaign to celebrate the 50th anniversary of the Abu Simbel salvage operation but is a unique message to the whole world that Egypt is a country of peace, science and great civilisation and its antiquities are the soft power that can easily penetrate hearts,” El-Enany told Al-Ahram Weekly. The effect of the equinox was visible on 21 February and 21 October, but after the relocation, that shifted by one day. The salvage operation was proof that Egypt was able to adapt to changes and would not sit idly by in the face of difficulties it had to deal with, he said. Mohamed Saleh, former director of the Egyptian Museum in Cairo, told the Weekly that the ancient Egyptians had observed astronomical phenomena such as the helical rising of the sun during the vernal and autumnal equinoxes (21 March and 23 September). These days, the day is exactly 12 hours and so is night. The equinox takes place twice a year at the Tropic of Cancer some 50 kilometres south of Aswan at Bab Kalabsha in Nubia. The architects and astronomers at the time of Ramses II, Saleh said, had planned the Temple of Abu Simbel and hewed it out of rock some 180 kilometres south of the Tropic of Cancer. At this point, the rays of the sun fall upon the mountain in the morning 25 days before the vernal equinox, ie on 22 February, and 25 days after the autumnal equinox, ie on 22 October. The temple axis runs perpendicular to the outer mountain surface. The inner halls of the temple were laid out exactly towards the main sanctuary, which contains statues of Ramses II and the gods Ptah, Amun-Re and Re-Hur-Akhty. 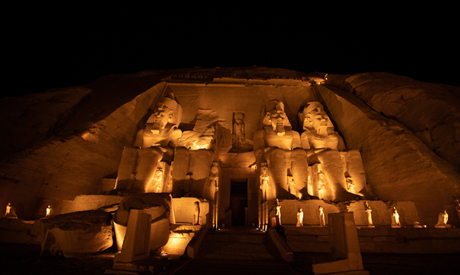 During the vernal equinox, they illuminate the statues of Amun-Re, Ramses II and Re-Hur-Akhty for a few days. During the autumnal equinox, the statues are illuminated from the reverse side for the same period.